Benay: Welcome to another episode of Coach Pep Talk, the podcast for people who run their own coaching businesses. Each week I talk to an expert who shares wisdom that helps us be better coaches and better coaching business owners. 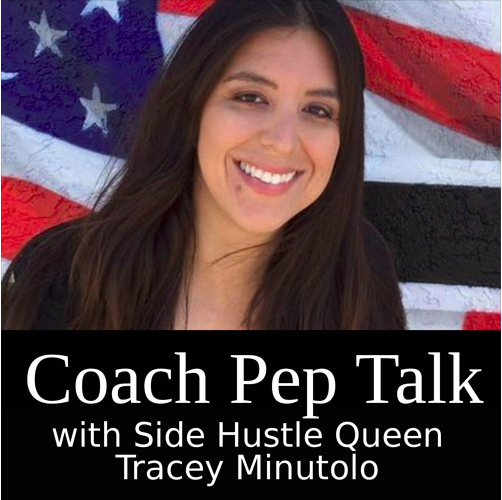 This week I’ve got Tracy Minutolo on the line and she’s talking to us all about starting a coaching business as a side hustle business and how to test product ideas before you launch them. So I’ll catch you on the other side. Benay: Coach Pep Talk is proudly brought to you by Life Coach Office. Gain ultimate freedom and flexibility in your coaching business with Life Coach Office, the online coaching software specifically designed for the single coach coaching business. You can use the software to manage your client files and coaching resources all in one place online. And it’s all under one umbrella with an easy to use technology. If you’d like to give Life Coach Office a try, you can do that for seven days no credit card required, just an e-mail address. Check out www.lifecoachoffice.com/. Benay: Today I’ve got Tracy Minutolo on the line who is a longtime side hustler and a side hustle evangelist. She firmly believes that there is a business inside of everyone, if they want it. She has made it her mission to help people start side hustle businesses, which I think is an awesome niche. Today she is going to be talking to us about the trend of side hustling today. Who is it for. Who is it not for. And then we’re going to move in to how to validate your first product idea and your side hustle concept. So let’s hear what Tracy has to say. Benay: Hello Tracy and welcome to the show. Tracey: Thank you so much for having me here. Benay: It’s awesome to have you on the show. I’m already loving your energy and can’t wait to hear what you’ve got to say. So as the queen of helping people start a side hustle, can you just set the stage for us and tell us what a side hustle actually is? Tracey: Yeah absolutely. In the broadest sense of the term a side hustle is, really in my mind anyway is really just anything that you do outside of a main gig, which could be a full time job or it could be your main business and maybe you have a side project. It’s like anything that you would do on that side. Benay: And can you give us a couple of examples either in your life or in people you’ve worked with in the past? Tracey: Sure. So I mean even if you know you want to consider things like side jobs, so part time jobs and things like that. like I’ve had some interesting part time jobs in my life, I’ve worked in bookstores, I’ve delivered pizza, all sorts of things like that. But I primarily specialize in helping people start service based businesses. So and for example my first side business, it was virtual assistant business helping podcasters, so I did show notes. I did a lot of the behind the scenes work, guest interactions and a lot of research on the guests, and social media all kinds of things like that. Benay: Let’s see I just thought it was interesting when you were talking before the show you said that you currently have a full time job and a side hustle business. Can you just tell everybody what you’re your full time job is? Tracey: Sure. So I was probably one of the rare folks who actually went to school for something and then almost immediately got a job in my field. So I was lucky. I graduated at a good time in the economy. But I am a microbiologist. And right now I’m working in a quality control lab and basically you know for a company that does diagnostic kits. So yeah, it sounds maybe dry but it really isn’t. And actually the cool thing about it, I think the part that I’m starting to love more as years go by is really the leadership aspects and working to help develop my team, develop my direct reports, working with them, finding out where they want to go in their careers and helping to get them the opportunities they need to make progress in their careers. So it’s it is, it’s an element of, it’s a form of coaching really. Benay: Uh Huh, that’s really cool. I know when I first started my coaching business back in 2006, I was in I.T. and definitely had a full time I.T. job and started my coaching business as a side hustle at first. I eventually talked my bosses into first letting me have four days a week at the job so I could coach one day, and then it was two, and then eventually I could make the transition fully. So I’m a big believer in starting this way and having that sort of plan that plan B.
Tracey: Yeah but that’s really awesome that you’re able to get that flexibility with your employer. Benay: It’s amazing what employers can do, if you just ask. I’m always just amazed. A lot of people actually just don’t think it’s possible and they never ask. And what I found with myself was I actually ended up being a lot more productive on the days when I was at work. I guess because I was being fulfilled in so many levels and I really wanted to you know to be able to have my coaching days so I was you know I think it improved my work ethic. It was already high, but you know it got even better and I was more efficient. Okay, let’s move on. So I’m really curious about side hustling as a trend. That’s a word that I’ve started to see a lot more in the media. And I was just wondering Tracy, is side hustling a growing trend? Is it related to any sort of generation or what’s your View on that? Tracey: So it’s interesting from a lot of what I read you would think and most people are reading, you would think that site hustling is kind of a millennial thing. I think that there are probably pretty specific reasons for that. Just the way the economy has been in the past several years and also just a function of you know millennials coming up with more of a different spirit towards work. And I think they just have a different view on what work should be and what it could be. But I will say not being, I’m not a millennial, I’m a gen-x’er. Tracey: I’ve been at it for, side hustling for a while and what I’m seeing more recently, now that I’ve been in this coaching space, is folks that are closer to retirement age now are wanting to kind of do this like second career. They’re exploring different possibilities and they are, like actually I spoke to somebody yesterday who was in her 50s and she wants to start a business doing animated shorts actually Excerpt from podcasts. So she would take kind of the takeaways, the main takeaways from a podcast, and animate it. And create this whole little thing that you can put on YouTube and just so awesome. Benay: What a cool niche! Tracey: I know, I know, I know. And I’m blown away just by the ideas that folks have. So it’s not really, I don’t think that it’s definitely, it’s not exclusive to any one generation. Benay: So do you think that side hustling is a good way for a new coach to start out in their coaching business? Tracey: Yeah I do. I mean obviously I’m biased because that’s what I’m doing, but I think it depends on your personality. It depends on what you want out of all this because there are some frustrations that come along with doing this on the side and I think the big one for me is just kind of watching my peers zoom along and seemingly making progress faster than I am but that’s because I’m putting 15 hours a week in, I’m not doing this full time. So that’s one drawback, but obviously the benefits for me you know kind of far outweigh that. One, I’m able to you know get fulfilled through my day job as well as through coaching because I know I really enjoy what I do during the day. Two, obviously you know I can have my health insurance and that’s nice and a steady paycheck so you can’t really argue with that. So it’s kind of neat to have that as kind of, the way I look at it is it’s like a foundation, having a steady day job can be like a foundation and then you can send feelers out and explore with your side hustle. Benay: Yeah I think that’s really cool and I love how you sort of made that point, that you might like your coaching business might grow a little bit slower, because I know as coaches, myself included, we can be incredibly impressionable and want to keep up with what we’re seeing all these gurus and our peers doing in the coaching industry. But we’re on our own journey and our own path and as long… Like you said, you’re growing slower, but you’re loving your day job too, so it’s a choice that you’ve made and you’ve really taken responsibility for that progress. And I really love that. So You’re coming from a place of real empowerment. Tracey: Yeah absolutely. And for me I’m in this for the long haul so my number one priority is really just to develop as a coach and really to become the best coach I can be. So however long that takes you know, it’s okay. It really is okay. Benay: And you’re going to enjoy the process and you’re going to have your security and all those are the things that are important to you on your journey with you, which is really cool. Tracey: Right, and be able to have the choice and have the options in the future whether or not I’d like to go full time with it. Benay: That’s great. Tracey I’m so happy that you just said that to everybody who is listening. Because I think that there are probably some coaches who really needed to hear that message. Okay. Yeah me too, that was really great. When we were talking about what could we set for the topic of this show, you said that something that was actually really important is a part of the process of you working with people and teaching them how to start a side hustle, was actually to hone in on their idea, hone in on a niche, whatever you want to call it, but then actually to validate that idea before you get too far along the process. I was just wondering if you could tell us a little bit why you feel that this step is so important to do upfront? Tracey: Depending on how much effort, or time, or money you’re going to invest in something you’re developing. I think that should be, that should directly correspond to how much time and effort you put into validating the idea. So when coaches are first getting started and they don’t really have a clear well-formed offer yet, they don’t have a lot of experience, and they don’t have testimonials then I say don’t validate. Get out there and just you know kind of get your feet wet. Figure it out you know basically on the job. Learn as you go and develop things. But I think as your business starts to develop and you want to start thinking about things like maybe group programs, or you know structuring your packages in a new way, or you know even doing something like an info product down the line, then you absolutely want to validate. And it is really really important, just because you want to make sure that when you go to release something that you’re not launching the crickets. Benay: I just want to just want to make sure that I’ve heard everything correctly. So you suggest that when somebody is actually starting to not waste too much time on validating their idea or honing too much in on a niche, it’s just actually just to start, get out there and start coaching. Tracey: Yeah yeah get out there and just start helping people, but this would be for somebody who is a brand new coach. Somebody who is really just taking the leap and just starting out and really just to get that experience and to get you know, develop a framework for your programs and that sort of thing. Benay: Validation really comes into play once you actually have some experience on your belt you have an idea about where you’re heading and then you want to validate that idea that’s based on this coaching experience that you’ve harnessed. Tracey: That’s right because through working with clients you’re going to discover that there are certain things that you enjoy more than other things, certain aspects, certain types of people that you prefer to work with in certain areas that are more exciting for you and then you know some things will start to take shape for you. And then you will be in that space you know, and you don’t need to spend that much time in the other space where it’s kind of just taking shape, things will naturally take shape so you’ll be there Before you know it. Benay: Yeah that’s an interesting thing because you do just kind of have to just trust that just by being out there and getting some experience under your belt that actually something will form. It just, it happens. You have to just kind of trust. haha. Tracey: Yeah yeah yeah. Definitely. Benay: But you’ve got to go with the flow. And it takes some people longer than others. It took me forever to find my niche. One rule of thumb that I have been saying for a while in my coaching business is that for coaches that are just starting out, that a good rule of thumb is kind of that 200 hours of coaching experience mark. Would you agree, disagree, have something else to suggest from that marker? Tracey: I think that’s amazing. That’s awesome and that’s definitely something everybody should strive for. I think for me just being a side hustler, that’s going to take a little bit more time. It’s going to be a little bit tougher, but you know that’s one of the things that like I definitely strive for even if it’s not formal coaching, it’s just to have a lot of conversations. Learning About my target market and I’m just taking all that information and soaking it up like a sponge. Benay: When I was starting out because I knew I had this 200-hour mark, like I wasn’t going to be a good coach or understand enough until I had two hundred hours. So like I would just go out and book you know six… Three people up for six sessions if I could just get those hours. Some people disagree with that approach but I think that sometimes you just need to go through the motions and figure out what you like what you don’t like. I did so many time line interventions and values things that I was like, okay I don’t want to do this for the rest of my life. I was sick of it. So it was actually really valuable even though I didn’t make a whole lot of money when I was starting. Tracey: But you learned a lot. Benay: I learned so much and it actually heavily influenced the way I, of course integrated that kind of thinking and learning into my coaching programs down the track. I just didn’t do it in the traditional timeline, but I definitely use those tools in my coaching, so it was awesome. I’m so grateful that I just got out there and did it and yeah it just sucked it up and felt like, I’m not doing it right, everybody’s better than me. But it paid off in the end. It came around. Benay: Yeah I think they do too. So it’s kind of important to talk about it. If you’re out there and you’re listening and you’re feeling like, I’m not moving faster enough. Or am I doing this right? it’s okay, you’re on your own journey and you’ll get there in time that you need to get there. Benay: I’m a huge believer in that. So let’s say we’ve got a coach and they’ve gone out there they’ve got their 200 hours under their belt you know, they’ve got some experience, they’ve got an inkling of now where they want to go, they’ve got a really good idea that they’re starting to feel pretty solid about. Just sort of set the stage here, would this be like, what kind of level are we talking like they might have narrowed down, okay I think I want to be a career coach, or is it even more specific than that? Tracey: So you definitely, in order to really start the validation process, you need to know who you’re targeting with your service and you need to know pretty much you know at least in the broad sense you know what type of service you’re going to offer. So you know, I’m obviously a very specific example, where I work with people with service based side businesses, so that’s kind of a specific thing but I think you know if you are thinking you want to go the career route, you want to help people with their careers, think about what stage of career you want to work with people at. Think about you know maybe a particular industry that’s interesting to you. Think about a particular aspect about it. Is it something along the lines of helping people interview, are you an interview coach. You kind of want to think about it in those terms and like where is your sort of your sweet spot. you know what do you enjoy. So you do need to narrow down to a degree. Benay: Okay so let’s say they’ve narrowed down, they’ve got their ideal client narrowed down, they’ve taken it from career coaching to saying yeah I want to help people in the interview process for example. Are they ready to start the validation process then or do they need to do anything else first? Tracey: I would say yes, but I almost would say maybe go a little bit further and say I want to help maybe new college grads with the interview process or I want to help people in mid-level you know in their career you know go for a particular type of position. So, but yeah I mean you’re getting closer. So I think you know as long as you can get at least to that point and you can start to think about people in your head, that’s kind of a key point, is that you could actually connect what you’re looking for, the person you’re looking to target, you can actually make the connection to somebody in real life. Benay: That you actually know. Okay. Tracey: We’ll need to talk to people. Yeah. Benay: So that person that you’re visualizing in your head, is that somebody that you may have coached in the past? Is it a friend? Does it matter? Tracey: It could be either, it’s just anybody that you can have a conversation with. It could be a friend of a friend. You Might want to reach out within your network and say hey I’m thinking I’m offering this service do you know anybody that might be able to benefit from this. Benay: Okay so here we are we know a specific type of person that we want to help, we can even visualize that person because we know them, or a few of them in our circle, and we’ve honed in on an industry that we want to focus in on, like career coaching for example, and a specific topic like interview coaching for say the who is the college grad and you know I know Emily who is a college grad. Are we ready now to validate that idea? Do I need anything else? Tracey: Yeah you’re ready now. Yes. So now you want to get out there and you want to just start setting up conversations with as many of these folks as you can find. It’s best to do this either in person or over something like Skype, but if you are not able to, you know the phone is fine as well and so is e-mail. I mean as a last resort to try to get that information. And you can also create a survey to get a bunch more data points for yourself. But the key is really just to get out there and kind of get that information directly from the folks that you want to help in their own words. Really have them, get them talking. So these conversations are not pitching conversations, you’re not really on there trying to close. They’re not really technically like a discovery call. This is really just information gathering. So what I recommend is something like a 20 to 30-minute conversation. It doesn’t have to be much more than that. And what you can do, what I have been doing, is if somebody is willing to chat, I’ll send them a short survey in advance so I can get all the particulars on what their side business journey has been like up to this point and that way when I get on the call I can really just sit back, ask them a few more questions, and just say you know tell me a little bit more about this and then I am just listening and I’m not typically taking notes. I will ask for permission but I do record the conversations so that I can go back later and pull out pieces of the conversation and what was said and I can use that. It’s a really really awesome to be able to use that in sales copy or in posts or something you know to put out. But also just allows me to be really present in the moment and in the conversation and really trying to like connect with the person. Benay: Probably a couple of people might be thinking, Ah okay so I don’t know that many people that actually fit this, you know my ideal person, my ideal client. How can they how can we find them if they don’t know heap’s? Tracey: You know you know more of these people than you think you do. That’s one. So the first thing is you know and I know some people may be shy about this but you know you have to you kind of have to get over it. You have to tell your friends and family what you’re up to. Let them know what you’re offering. Put something on your Facebook page and don’t put it up once, put it up a few times though. Once you get some folks on the phone and you have a conversation, ask them if they know anybody else. That’s a great way to find more people to talk to. And then, you know if you want to go to the survey route, like I do spend some time in Facebook groups, so you know in groups too, where I know the admins, so I’ll usually say, you want to ask permission first generally and most of the groups. Say you know I am wondering if I could put up this survey I’m looking to do a little bit of research on this thing that I’m developing. And you know it kind of depends on the group, but usually you can get that going or somebody, you can get a friend to share the survey for you or friend to ask on their Facebook page for you. And that usually kind of gets the ball rolling. It’s pretty neat. And then you know another thing I’ve been doing recently too, is if you have something like your own Facebook group or an e-mail list, is when somebody new joins, reach out to see what’s up, see what’s going on. and Really just try and connect and then usually you know they signed up for your list, or they joined your group for a reason. And so if it’s right, if it feels like it is an appropriate time to ask just say hey you know I would love to chat with you for 30 minutes would you mind if you would. Does that sound good? And these are really informal things and it’s really very much about helping them in that moment you know with maybe giving them some nugget to take away that will help you know with what they’re working on. But at the same time you know it’s valuable for you because you’re getting firsthand you know like what what’s going on with them and you’re getting to understand more and more and more about this quote unquote problem that you can help with. Benay: Do you recommend any specific survey tools? Tracey: I really love Type Form. It’s the one that I use. Benay: But let’s just get a feel for the high level overview to validate your business idea, You’re going to set up these conversations. How many steps are we looking at in this whole process? Before I start getting too much into the weeds about survey questions and what are we looking at? Tracey: Step one is to identify who you need to talk to. Two, is to set up the calls. Three would be kind of like execution mode, so now you’re talking to everybody that you can. But I would put a deadline on it. You don’t want to do this forever. You know for one particular project, or package, or something you’re developing you want to kind of put it make it time bound right, so you do that and maybe it’s 10 people you talk to. And that’s great, it’s fabulous. Benay: Is ten a good number? Do they need 100? Tracey: 100 is better but 10 will do it. Ten people, if they’re really fit your target market, you’ll get some great information. But basically you know again, like this is just information gathering and so you’re going to take this back and you’re not going into these conversations telling this person like, hey I’m developing this package, it’s going to be this many session that’s going to cost this much, what do you think. You don’t just go in like that. You want to go in and say, hey You know like tell me a little bit about this and you know where you’re getting stuck. What solutions have you tried for this before. What did work what hasn’t worked. What other types of solutions are you looking in to? Have you paid for coaching before? Just trying to get a sense for their background and what and where they’re at. But you don’t want to steer the conversation in terms of any particular type of offer. You want to let them kind of just tell you. Benay: Yeah I hope everybody was taking notes on those great questions you just listed. So the survey that you send out before, is that more focused on demographic kind of information, like are you male or female, how old are you, where do you live? And then the interview is those kind of questions that you just listed. Or is it a mix? Tracey: I think it could be a mix. I think, I am experimenting with different things all the time. But what really worked well for me on my last round of validation was something that was, took less than five minutes for somebody to fill out, but it was like you know your name and this one and this particular offering was for somebody who already had a side business so I just said What’s your business. You know what’s the website. Your social media handles. You know where are you stuck? You know that sort of thing. Very general. but I got some great information on that, and then I had at the end I said you know if you wouldn’t mind I’d love to follow up and chat with you about some of your answers if that’s okay, could you leave your email address and boom there you go. Benay: And what was the response rate of the people who filled it out, how many actually said, yes sure let’s talk? Benay: That’s awesome! Wow, well done. Okay let’s go back to our steps so we’ve got to step three. I’m just trying to get a feel for after we’re in execution mode, then what comes next for this whole complete validation process that we’re doing here? Tracey: Well you want to capture all the information in something like a spreadsheet, if you’re geeky like me, or something like that. But you want to make sure you’re capturing all the good nuggets that you’re getting back, you know in some way that you can. Take A look at and see any trends, especially when it comes to like pricing, or the length of the session, or the amount of follow up. In my particular case I was validating a package that I’m calling the Side Hustle Boost, and it basically it’s a one deep dive session followed up with 90 days of support. So I wanted to know. And that came from these conversations because at first it was just going to be this one off session, because I know a lot of coaches will do something like that. I’ve actually done one of those with a coach, but I keep hearing over and over again, yeah that’s great but I need like more support to make sure that these things stick. So you’re taking all this information down and you’re starting to see you know some common threads and you can start to piece together what the offer should look like. So that’s what you’re doing and the next step is really just refining the offer and getting it ready to release and sort of like a beta. You know you want to get something out there. Benay: So step four it to capture the info and look for trends, and then is it step five where you’re actually putting together your offer? Based on the information you’ve gained? Or is that still part of step four? Tracey: No that could be Step 5. Benay: Is there anything else you want to say about that offer step before we talk about how to put it into beta? Tracey: No that’s pretty much it. I mean and it doesn’t have to be perfect. I think that’s the thing to remember here too. Benay: Really important! So many people procrastinate because, oh it not ready, it’s not ready. Tracey: Exactly. You Just want to give it the best possible chance of having success. The best possible you can you know. Benay: But still keep moving forward, that momentum going, if you notice that you’re stalling then you’re procrastinating. Get moving! Tracey: That’s why I see it should be time bound, so it should be like X number of conversations in X time period. It’s fine and I’m going to launch this thing. Benay: Cool. Okay So once we’re ready, we’ve come up with our amazing offer that’s based on all of this fabulous information we’ve gathered from our ideal clients. How do you go about doing the, launching the beta offer? What’s important about that step? Tracey: The really cool thing is that chances are a lot of the folks that you talk to in these interviews have a little bit of an interest in what you’re developing, so and I actually had, let’s see maybe 40 percent of them tell me hey when you’ve got this thing together, when you’ve got this offer settled, like come back and give me the details. So what I did was I circled back with them and I just gave them a discount. I said hey for being so nice as to talk to me, this is what I’m doing. So that worked out pretty well too. So not everybody took it, but about half of those folks took it. Yeah it’s pretty neat. So your kind of sowing these seeds, or planting seeds you know as you go. Benay: From a coaching perspective you have planted these seeds and then you have some buyers you know straight away even on your beta offer. So your confidence in your ability to continue on you know in following your passion you’ve set a really good foundation for yourself and really set yourself up for success. Anything else important that you’d like to point out about that that beta phase? Tracey: No, it’s just really getting it out there and you know I’m pretty new at the whole like developing marketing funnels thing. So I’m still kind of figuring that out. So I have some new lead magnets I’m developing that kind of end up in this packet, like taking people to this package. But you know a lot of people will, you know they have Facebook groups, it’s a great place to promote your new package. Obviously your e-mail list. and Yeah that sort of thing, just get the word out. And ask other people to you know if you know anybody that would be a good fit for this have them come talk to me. Benay: Okay. So is that the end to end validation process, or are there any other steps? Tracey: That Is, it as for right now. Yes. Actually if we get, let me see, yeah I think we will touch upon this but I think, that is for a specific package or product. But I think a coach would benefit, really most people in business would benefit from regular conversations with their target market anyhow. We can we can go further into that if you like? Benay: Do you do you find that’s something that actually people do very often? Do they skip that step? Tracey: Yeah I think that you know it’s probably really tempting to get away from it. You know the further, you know the bigger your business gets and you know kind of the further away you get from those day to day interactions with people. So I like from my own experience, Yeah. I mean I can say from experience that I have seen that. So you know and for me I don’t plan to grow my business to the level where it would reach that point because I like keeping this small. I like being involved you know on the day to day and having those conversations. But I think there’s definitely a danger there. Benay: Let’s talk about the whole end to end process of validation. Do You find that business owners sometimes skip it and they actually just jump straight in to developing products and launching their thing without actually having ever talked to anybody? Tracey: Short answer, yes. Yeah, because it’s exciting. It’s exciting. You have an idea, you just want to get it out there and I totally get it. You know I guess I did minimal validation on my first side business. That actually kind of ended up, well it was a huge learning experience for me, but it ended up being kind of the wrong business for me because I didn’t do enough research and enough sort of the validation, but also there’s just enough research into it. Benay: We’ve talked a little bit about timing but is there a time, I want to talk about timing and cost for the whole validation process. just to kind of put it into perspective. You know with the return on investment that you actually gain from it. What’s sort of a reasonable time and financial investment that you need to put into this validation process? And then let’s look at the return on investment. Tracey: Yeah. So I think it really depends again on what you’re trying to validate. So if it’s going to be something that you’re going to be investing quite a bit of money in to build, you know like a pretty high end course or something like that then, yeah you’re probably going to want a lot more data points. You might do surveys. Chances are you have a larger e-mail list at that point too, you have a lot more folks that you can actually survey/poll. You could use Facebook ads for that, to bring people in. But for me like again it’s very small. I’ve done this on just a very small scale so it doesn’t really cost me anything but time. Yeah the return on investment is tremendous because I’m not, you know I’m putting the time in and I’m having fun chatting with people in the process. Benay: I love that about the business model that you sort of created for you. I’m a big believer in your coaching business should give you more life and make you a happier or more fulfilled person first. And it really seems like you’re living that dream and just beautifully. Tracey: Thank you. Yeah I mean if my girlfriend can only listen to me talk about side business so much so at the end of the day I can find other people to talk to about it. Benay: That’s great and you’re you know you’re investing in having killer offers all at the same time and getting to talk about your favorite topic. Benay: Let’s say someone has gone through the validation process and had some of these conversations. What if what if they still get it wrong? Does that happen? Tracey: Yeah it can still be wrong, but I think it also depends on how you define wrong. If you’ve gone through this validation process, your odds of getting it right are much greater. I will say that. So you know I guess it could happen where you know there’s the famous example, I think we used college kids before, that’s kind of not a great example or People are just coming out of college because there is truth to the whole broke college students thing, so it might not be the best target market for somebody who’s just getting something started and you’re not really sure kind of how much disposable income there might be there. But yeah I mean again, if you have gone through this process and you have done a good job of really listening and honing in you know your skills and your listening skills with people, then it shouldn’t really be an issue. And I think new opportunities kind of present themselves too, once your kind of in motion doing these things. you Uncover something that you hadn’t really seen when you started. Benay: Yeah that’s so true. That just that simple act of momentum. I’ve been really stubborn in my coaching business and I’ve had lots of falls in my whole journey. You know some really, once I look back on it you know I almost collapsed as a person, but you know I’m stubborn and I just keep going but I’ve always got that momentum and I think that simple act right there of just keeping going Every day, every week is so important because you know you’ve got… Depending on where you’re at you’ve got heaps to learn and you know sometimes learning is painful. Tracey: I know. And The only way you can keep going and keep picking yourself up is if you find something that you know is aligned with you and your purpose and really is that you truly love. Benay: Yes, and believe in. Benay: Yeah. And I feel that way about my business and I think that’s probably a big crucial part of my stubborn determination. I wonder if your freedom warrior too? Ah, another conversation. Okay so let’s see we do kind of need to wrap things up now, Tracy. I think you’ve given some really fabulous information for people who are you know looking into validating that idea and especially pointing out that new coaches just need to get out there and get some coaching under their belt first. If coaches, if you’d like them to take one thing away as a result of this episode, what would that one thing be, if you could get them to take one piece of the action? Tracey: Sure I would just say again just incorporate having regular conversations with your target market and to your business activity. Just make it routine. Set a target for yourself. I’m going to have two conversations a week. If you’re a side hustler, like me that’s more reasonable but just do it. Make it a habit. Benay: Tracey, if somebody wants to learn more about you and check out your work, where can they go? Tracey: Sure, you could find me at traceyminutolo.com and I actually just had a time blocking workshop that I did recently and that’s available on my site if folks are interested in that, because if you’re a side hustler you need to find time for your side hustle. And then also I have a Facebook group called The Side Hustlers Haven, and if you go to sidehustlershaven you can go right to the Facebook group. Benay: Excellent, and I will include all of the links in the show notes of this podcast for everybody. Okay thank you so much Tracy for taking the time to talk to us today. It’s been an absolute pleasure to have you on the show. Tracey: This was so much fun. Thank you. Benay: And thank you listeners for tuning in to another episode of Coach Pep Talk. Please take some time out and go and like the show on ITunes. I hope everybody has a fabulous day. Happy coaching.